We are gathered here because of one man. A man known personally to many of us, known only by reputation to even more. A man loved by many, scorned by others. A man known for great controversy, and for great compassion. Even I was surprised (only momentarily) by the next sentence. That man, of course, is Jesus of Nazareth. It is He Whom we proclaim: Jesus Christ, Son of the Father, born of the Virgin Mary, crucified, buried, risen, seated at the right hand of the Father. It is because of Him, because of His life, death and resurrection that we do not mourn as those who have no hope, but in confidence we commend Antonin Scalia to the mercy of God. But of course, it is for Jesus that we come to Mass -- to worship, to praise, to give thanks, to petition, to offer ourselves. We come to offer our prayers for the dead at a funeral Mass. The stories and pastoral care of the family left behind is for another time. Thank you, Father Scalia for reminding us what this is all about. I do believe your father would be pleased. God bless you! I have to confess that over the past few days I've learned more about Justice Antonin Scalia than while he was alive. I pray God will send us more men like him. Requiem aeternam, Antonin. 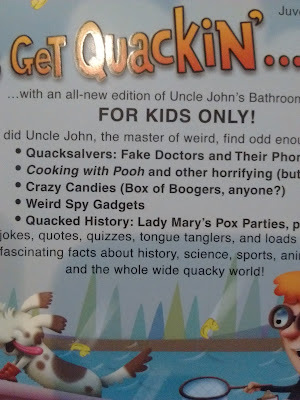 Today a package arrived in the mail ... with Uncle John's Totally Quacked Bathroom Reader for Kids Only!!! I am a proud contributor. One of my pieces is mentioned on the back cover. Can you guess? I barely had time to snap these pictures before my daughter nabbed a copy. 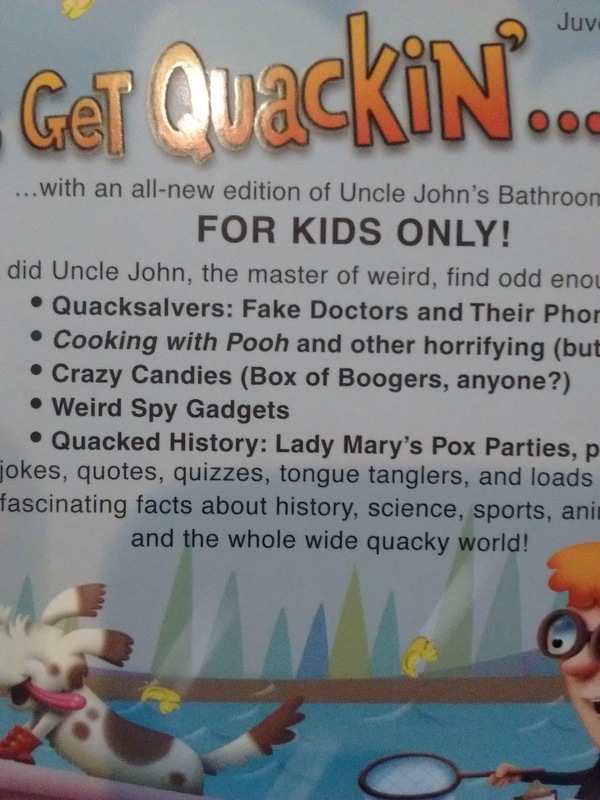 We are definitely a Bathroom Reader family ... Of all my book and magazine work, this is the one they can crow about to their friends. This is the big week -- last minute things to fix up the robot, bag it up, and take it for the competition. The challenge this year is described here. It's been a busy six weeks and I'm sure my guys are going to collapse and sleep for an entire day when they return. So it was great to watch this: Spare Parts, a movie based on a true story about four Hispanic high school kids, children of undocumented immigrants, who used all their ingenuity to make an underwater robot that beat even MIT. These kids surmounted great obstacles and it is a story that will leave you thinking about more than just robots. You can watch the documentary Underwater Dreams too, which has interviews with the students and teachers involved in the making the robot, and the legacy they leave for their school and community. It portrays the problems children of undocumented workers face. What is the solution? I don't know. I sympathize with the immigrants who are looking for a better life in the US. But to do so illegally causes so many problems, the first being living in fear, the second, painful separation of families when a parent is caught and deported, and third, their exploitation. Perhaps it's time for the US to recognize that we need the people who want to come here and work. Perhaps grant them a worker's visa, so that they can work freely, pay taxes and become a recognized part of this country. Our little church, Stella Maris, was crowded this first Sunday of Lent. 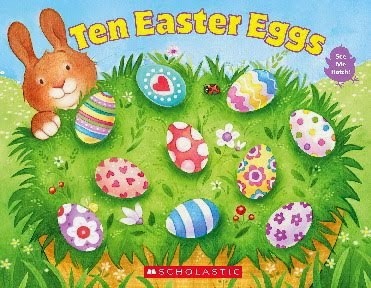 Ah, I thought, Lenten resolutions! But it was also St. Valentine's Day and we connect love with Church. Our priest could've spoken about the three temptations of Christ. Instead he chose instead to share a few thoughts about St. Valentine's Day, which I'm happy to say is still on the traditional Latin calendar. I'm not sure why it was dropped in the new calendar in favor of two newer saints. Maybe it was becoming too commercialized? 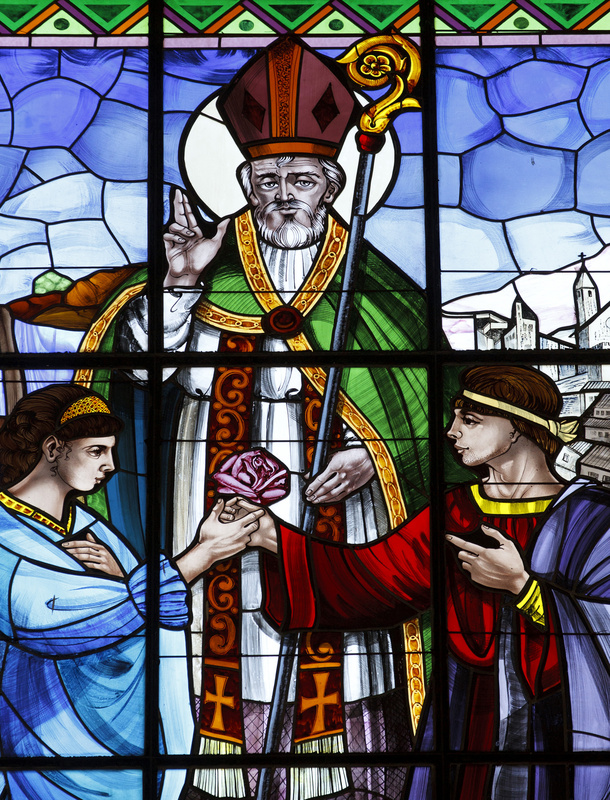 There are at least a dozen saints listed on Catholic-online for Feb. 14th but it is St. Valentine we remember and countless people, whether or not they're Christian, propose to their beloved this day or choose it as a wedding day. I didn't grow up celebrating Valentines and didn't get to know the saint until after our conversion. And what a beautiful story of love. There are possibly two St. Valentines in the early Church (2nd to 4th century) whose legends became entwined. 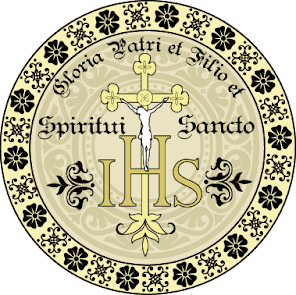 Perhaps the Church tried to sanctify a Roman fertility rite that occurs from Feb 13-15. She always builds on the traditions that are good in the culture as a way to preserve them. The story goes that St. Valentine, a priest, secretly presided at weddings for soldiers (at the time it was unlawful for them to marry) and he was imprisoned. While in jail, St. Valentine prayed for the daughter of his jailor and she was healed. There were conversions and the emperor raged (remember that Christianity was still underground). St. Valentine was to be beheaded for his role in supporting Christian marriage. His last note was to the jailor's daughter, signed, from your Valentine. This is a willingness to love until death. I also enjoyed our priest's thoughts on logos and mythos. Logos is what we know scientifically. Mythos is inner knowledge. So a myth is not necessarily an untruth but it may be the best way to preserve the truth. And all writers of tales know the power of story, because of the truth it contains. Happy St. Valentine's Day! Love each day. PS: Requiescat in pace, Justice Antonin Scalia. We will feel your absence keenly. I only vaguely remembered the escape of mother and daughter from Iran, so when I saw My Nameis Mahtob I was compelled to read it. This is the daughter’s story, based on her memories. Mahtob states expressly that even when she had the chance to read her mother’s book, Not Without My Daughter, she didn’t. She’d lived it and she wanted to move forward. She was nearly six years old when she, along with her American mother and Iranian father, went to Tehran for what was supposed to be a two-week vacation. Betty (mom) wasn’t happy about this because at the time Iran was at war with Iraq and Americans were hated. However, her husband swore upon the Koran that they’ll be back in two weeks. He lied. Mahtob remembers everything clearly. How her father changed from a loving husband and father to one who was abusive, hitting and threatening them. She was terrified not only by her father but the school teachers and soldiers and bombings. She recounts the 18 months they were in Iran, the local school where she was made to say things like “Death to America” and the soldiers with their guns. They waited patiently for the opportunity to plan an escape. As time wore on, her father became more lax and allowed his wife to do the shopping, a time-consuming chore with much standing and waiting in lines to get the most basic necessities. But this allowed Betty to ask for help from some shopkeepers, and praise God that they didn’t turn her in. The choice was mine and mine alone. And she wanted to go home to America. The escape over the snowy Zagros mountains into Turkey is presented as snapshots of memory. A busy square – or perhaps a circle – in Tabriz. Traffic everywhere, absolute chaos. Mom and I sit in the backseat. Mom and I are alone in a ramshackle stable, sitting on the dirt floor. Riding gingerly along the narrow, icy edge of the mountain, I don’t know if it’s the same night or the same horse or if I’m riding with the same stranger. What I do know is that Mom and I are separated, and I don’t like it. The first quarter of the book is fascinating and fast-paced because of all that Mahtob remembers living in Iran. But life in the United States isn’t peachy. They live under a constant threat of being found and kidnapped. Even so, Betty writes her memoir as a way to support herself and also gain public protection. She also helps others in similar situations. Mahtob is enrolled in a Lutheran private school and you can see how much the love of Jesus was a balm to this poor, suffering soul. Sometimes I wish she had it before they left Iran, but I am grateful she was consoled by Jesus in due time. It is great testament to Betty’s love that Mahtob is as forgiving as she is. It is Betty who gets Mahtob to embrace her Persian half and remember the good times they had together with Daddy before he turned into a radical Muslim. Mahtob is careful to say that she doesn’t think all Muslims or Iranians are wicked just because her father was the way he was. The pace slows down as Mahtob recounts growing up in America, the many times they have to move because they are afraid they’ve been found out, of never feeling safe. She feels guilty for putting her friends and extended family in danger. She is trailed by a student for a documentary that her father makes. And if this isn’t difficult enough, she is diagnosed in her early teens with lupus, an auto-immune disease. Mature for her age, she takes responsibility for learning all about managing her disease. Her experiences lead Mahtob to study psychology in college. She wants to understand why some people crack and why some are resilient. One of the exercises in her studies is especially therapeutic: counting happy moments, one by one. This was a turning point for her. Mahtob was able to notice the little things that made her happy and it became a habit. She was grateful not just for the big things, like being free, but for the little things as well, like rolling a pomegranate, drinking Turkish coffee, watching children play. This reminds me so very much of Ann Voskamp's One Thousand Gifts. I really enjoyed this memoir of two very brave and courageous women. My hope is that Mahtob will have a peaceful life after all she has endured, that no one will try to take up her father's cause (he's deceased) and exact revenge for not being the Muslim daughter he so wanted. 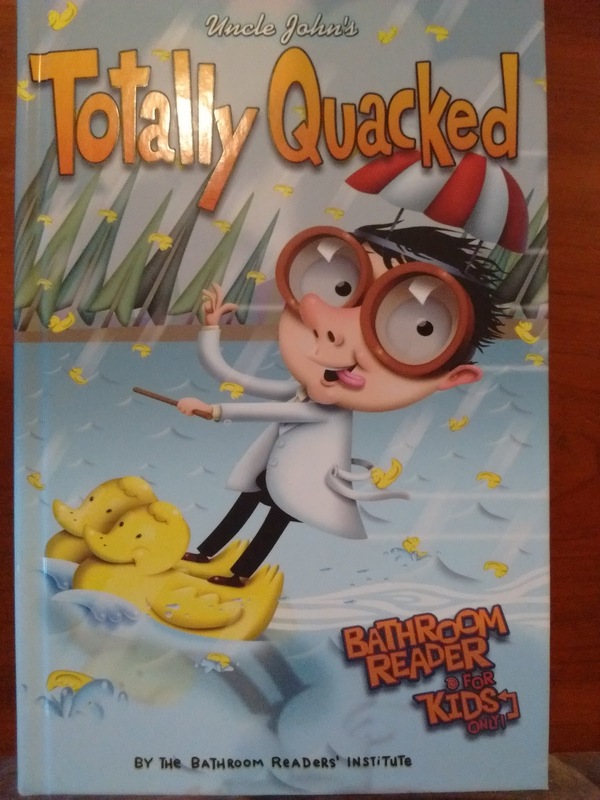 Thanks to BookLook for providing a review copy. I am posting this on Amazon as well. I am doing so much better this month, but there are gifts to count even while one is incapacitated. 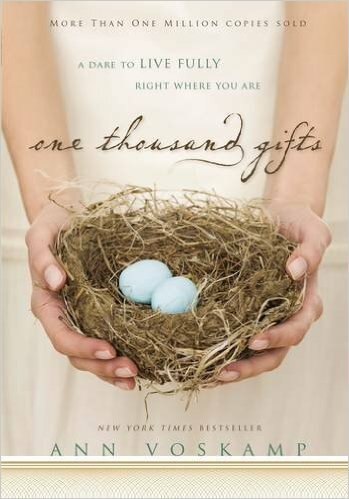 One Thousand Gifts: a Dare to Live Fully Right Where You Are by Ann Voskamp: Her name is so familiar, I must have read some reflections of hers in other books, so when I chanced upon this in the thrift-store I had to pick it up. I challenge you to do as she did -- name a thousand gifts -- one thousand blessings, ways you realize you're the beloved of God. I guarantee you, even in your hardest moments, you'll be able to thank and bless the Lord. What I loved about this book is how poetically Ann writes about the ordinary things -- laundry, cooking, playing with children. She's a pig-farmer's wife, raising their six children. I'll share this with Dagny when she's a bit older. Ever since we saw that episode on Little House where Nelly runs off to marry a pig farmer, we've joked about her marrying one as well (for all the bacon). I'm afraid that the modern woman is often left feeling "is this all there is" because she's not been trained to embrace her vocation -- marriage and motherhood. And without that, the daily work of feeding and caring for children and home become a chore, instead of a calling from God to bring souls to Christ. Gifts. Offerings. "Eucharisteo -- thanksgiving -- always precedes the miracle." 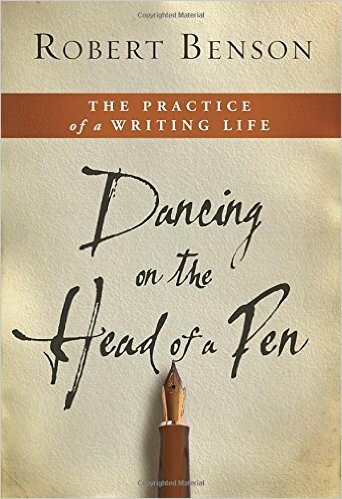 Dancing on the Head of a Pen: the Practice of a Writing Life by Robert Benson: I received this as a little freebie from Waterbrook Press and what a joy it was to spend some time with a person who is both deeply spiritual and loves writing. It's not a how-to book per se, but rather a why-to book. I'm at a creative low right now and it's helping me to examine why I write. This book reminded me very much of my dear friend Mel Boring, who taught at ICL and who used to encourage me much the same way before his death a few years ago. But some advice is spot on: "O begin." Like Linda Sue Park, he writes 2 pages a day (600 words). Keep a journal. "A journal provides a place for him to learn to speak truth to himself about himself or discover his capacity for disingenuousness. A place to discover when he writes too fast of too glibly, too carefully or too safely. A place to discover his voice slowly over time so that when the real game is afoot, he can trust it." Read good books; they are our best teachers. 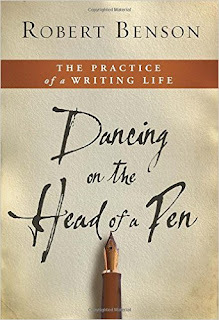 "A direct relationship exists between the caliber of the writing you read and the caliber of the writing you make." 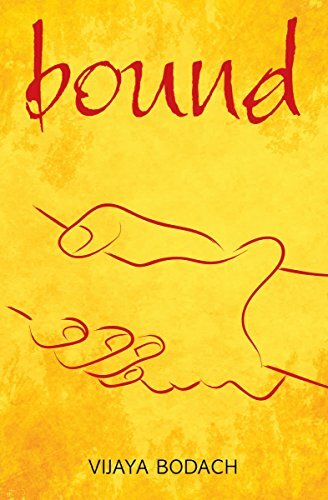 Letters to a Young Poet by Rainer Maria Rilke: This book has popped onto my radar many times over the dozen years I've been writing so I finally felt compelled to get a copy. I'm not disappointed. The advice in the first letter itself is worth the price of the whole book. Ex. "Go into yourself. Find out the reason that commands you to write; see whether it has spread its roots into the very depths of your heart; confess to yourself whether you would have to die if you were forbidden to write. This most of all: ask yourself in the most silent hour of the night: must I write? Dig into yourself for a deep answer. And if this answer rings out in assent, if you meet this solemn question with a strong, simple "I must" then build your life in accordance with this necessity ...."
"... Then take the destiny upon yourself, and bear it, its burden and its greatness, without ever asking what reward might come from the outside." "...have patience with everything unresolved in your heart and to try to love the questions themselves as if they were locked rooms or books written in a very foreign language. Don't search for the answer, which could not be given to you now, because you would not be able to live them. And the point is, to live everything. Live the questions now. Perhaps gradually, without even noticing it, live your way into the answer."